Keep up to date with the latest news at Countryside Equestrian. This is where we will let you know of new Product ranges, Shows that we will be attending and other general information. Don't forget we would love to hear your news too. Do you have something interesting to tell us about any of our products maybe you've seen one of our jumps being used in a particularly innovative way? 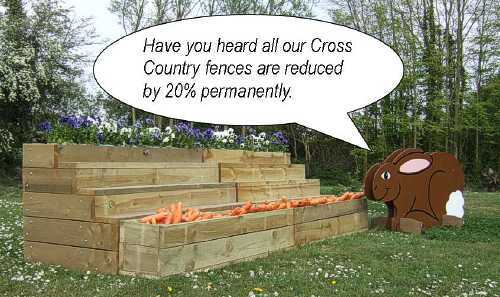 Or maybe you just had a rather successful competition over a set of our fences? Whatever it is just drop us an email and we would love to add you to the Customers News pages. Like us on Facebook and good things will happen. We are currently offering our followers discounts on Mounted Games equipment. Checkout our Facebook page by clicking the image right for full details. Burnham Market and Houghton Hall International Horse Trials 2014. To show our support we have supplied them with two of the above signs to promote the charity at the events. "Big C Norfolk’s Cancer Charity would like to thank Country Side Show Jumps for our two amazing boards. These will look great at Burnham Market and Houghton Hall International Horse Trials this year we received amazing service and amazing quality. Thank you from the Big C team"
In the biggest review of prices we have ever under taken, we have decided to reduce our entire Cross Country range by 20%. These are hard economic times and we wanted to be able to offer all our customers high quality fences regardless of budget and spending power. Please note new designs in 2013 will have the discount already built into the price. We have decided not to have a trade stand at the Suffolk Show 2013.